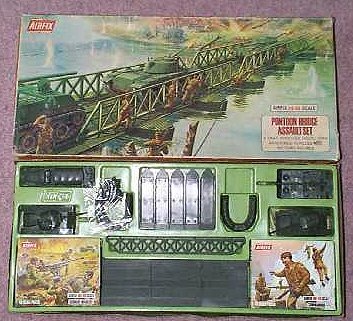 The contents of this comprehensive set enable an exciting river crossing to be re-enacted. There are two sets of opposing soldiers, two tanks, an S.P. gun and also a D.U.K.W. The Pontoon Bridge itself consists of two main sections, five boats and ramps. Sand bag positions complete the scene.